In the past week I came across a couple of fabulous ideas for recycling old books. Mind you, these are for books that are beyond saving, or books that are truly past being useful, because they are destroyed in the process. But it’s to make something new, beautiful, and useful! The first thing to do is chop the spine from a hardback book and remove the pages. Take the front and back covers and blank notepaper a little smaller than the book covers, hole punch and spiral bind the cover and papers together. Voilà! A blank notebook in a sturdy, personal cover. I spotted this basket of adorable recycled book cover notebooks in a tiny shop in the art community of Jerome, Arizona. Any office supply store or print shop can do the hole punching and insert the spiral or comb binding (they can also chop blank paper to fit correctly), but a manual comb binding machine to punch holes and insert binding all at once is actually quite inexpensive and only a bit bigger than a three-hole paper punch. 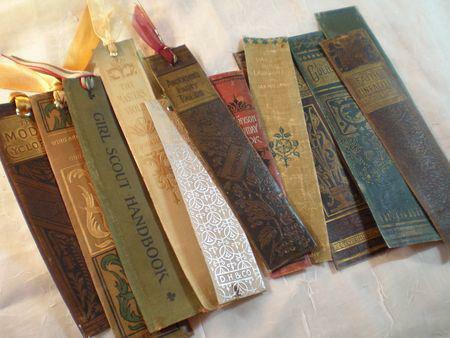 This idea comes from the blog Green Paper, where she makes spines from old clothbound and leather books into adorable bookmarks! She does not give a tutorial, but it looks fairly simple: clean up the edges nice and straight, punch a hole at the top and add a grommet with a simple scissors-style tool (the grommet is the metal ring so the hole doesn’t tear further), and add a pretty ribbon to hang outside the book. Another voilà! As for what to do with the insides of the book … do an internet search on “crafts from book pages.” Go ahead. I dare you. Do Humans Have Vegetarian or Omnivore Teeth?